I have never been a huge hummus fan. It’s ok, I thought. I have been eating a lot of it in Israel, sort of like an American eats peanut butter as a very affordable staple. But I have never loved it. 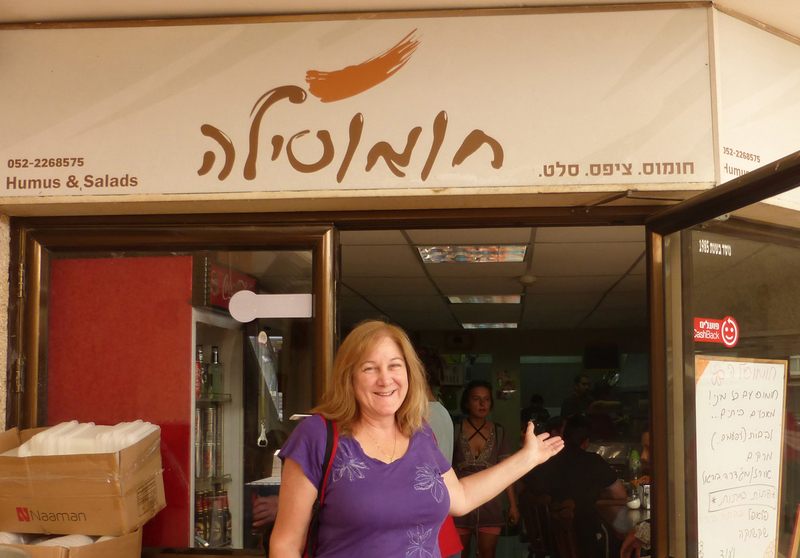 Recently though, I had amazing hummus in two places in Israel — and I now love hummus! 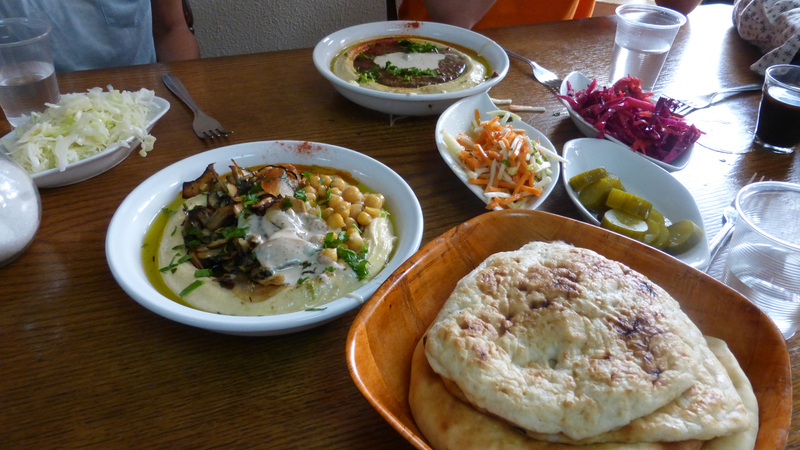 The two great hummus eateries I have experienced are in: Tzfat (Safed) and Qatzrin (Katzrin). This post is about HummuSila in Qatzrin (Katzrin). This hummus eatery is in one of the two central shopping areas of Qatzrin. One is a covered mall, the other is outside. This is the one that’s outside. I am told that if you just say hummus to anyone in this town, they’ll know where to send you. 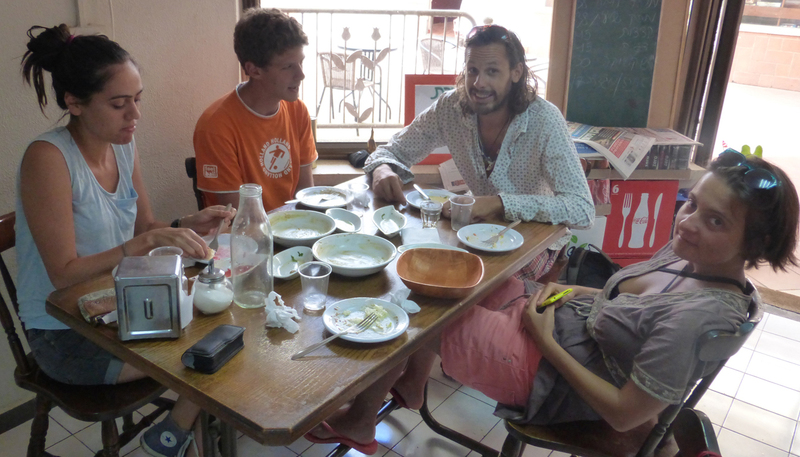 We walked from Golan Garden Hostel and it was an easy 10-15 minute walk. The kind English-speaking couple that owns this place serve more than hummus, but that’s what we’d all come for, so that was our focus. Mike, a fellow guest, and I had heard the owners and staff of The Golan Heights Hostel speak of this place as a must so we weren’t going to miss this. Two single servings of hummus accompanied by free salads. Two plates of single serving Hummus for 24 NIS ($6) per plate. There are several toppings to choose. We loved the fried mushrooms with onions closest to you in this photo. Our other plate is fava bean-topped. Another option would be meat. The salads and bread came with it. And one plate of sliced fried eggplant not shown here. Notice the bread in the foreground? This is not your typical pita. It’s their special bread. We were five people so they automatically served us a couple of regular pitas and three of these. None of us wanted that pita. Happily, after we’d each had half of the good stuff, I asked for more of it and a hot plate of it was happily handed to me. Two of the salads came with Cilantro (aka Coriander or in Hebrew, Koosbarah) so the proprietor kindly brought me a plate of salad without any. Those are the kind of things that impress me! We polished this off nicely. Every bit of bread that we had was used to wipe those plates clean. Not a bit of the salads were left over. Now we really got every last bit! Open from about 10 or 10:30 a.m. to 4:00 p.m. Arrive before 4 if you want to eat and they won’t kick you out exactly at 4.